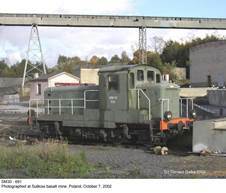 This SM30-691 was photographed at the basalt quarry in Sulików on October 7, 2002. 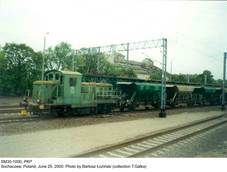 SM30-302 at the Toruń Kluczyki loco depot; photo taken on August 8, 2003. 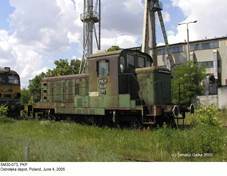 Derelict SM30-002, photographed at the Ełk depot on June 15, 2006. 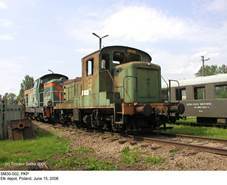 SM30-1060 (Fablok 7878/1970) under restoration at the Railway and Industry Museum in Jaworzyna Śląska; photo taken on August 4, 2004. 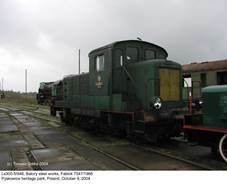 Operational Ls300-5/948, formerly used by Batory steel works of Chorzów, now at the railway stock heritage park in Pyskowice; photo taken on October 9, 2004. Note ‘SM30’ on the rear buffer beam. 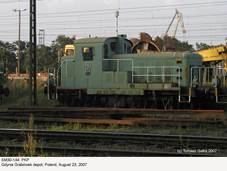 Withdrawn SM30-073, photographed at the Ostrołęka loco depot on June 4, 2005. 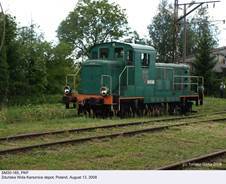 SP30-006, displayed at the Kościerzyna railway stock heritage park; photo taken in August 2001. 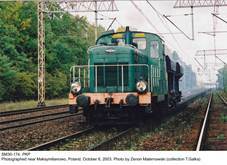 Another photo of this locomotive, taken on September 23, 2013. 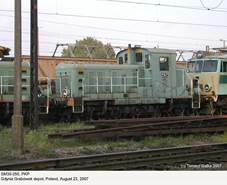 Second preserved SP30-218, photographed at the Skierniewice depot on September 17, 2006. 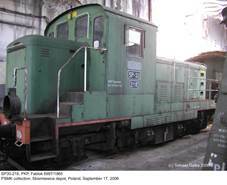 SM30-039 preserved at the Zduńska Wola Karsznice depot, October 26, 2005. This SM30-165, photographed at the same location on August 13, 2008, still remains in service. ...and SM30-275; both photos taken on July 2, 2006. SM30-009, location and date unknown. Photo from my collection. 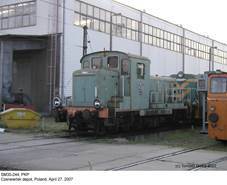 SM30-244, PKP, Czerwieńsk depot, April 27, 2007. 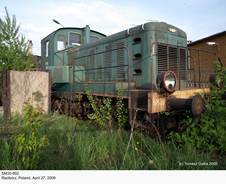 This SM30-836, photographed in Rogów on May 19, 2007, probably belongs to a track maintenance company. Relatively few SM30s still remain in the PKP inventory. 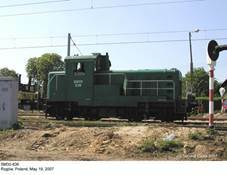 This SM30-036 was spotted near the Warszawa Żerań station on May 28, 2008. 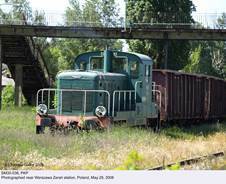 Ls300-823, Konin lignite mine; photo taken at the mining railway depot in Kleczew on September 16, 2008. SM30-086, photographed at the Jelenia Góra depot on November 29, 2008. SM30-892 (probably withdrawn), photographed in Racibórz on April 27, 2009. 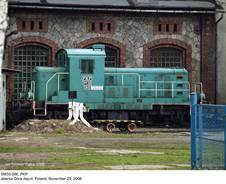 This Ls300 (Fablok 7832/1969) has been plinthed at the Tychy Brewery – a place dear to my heart. Photo taken on April 30, 2009. 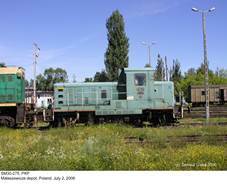 Back to Pyskowice: Ls300-774, photographed on May 2, 2009. SM30-292, location and date unknown. Photo by H.Magoń (postcard from my collection). 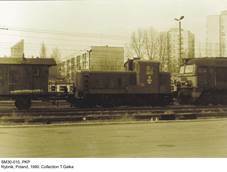 SM30-179 (Fablok 6959/1965) with a passenger train in Zbąszynek, Augst 9, 1994. Photo by Waldemar Michniuk via Norbert Tkaczyk (used by permission). 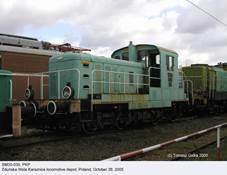 …and SM30-694 (Fablok 6719/1964), photographed at the mining railway depot on September 20, 2011. …and SM30-105, location and date unknown. SM30-010 (Fablok 3540/1960), photographed in Rybnik in 1990. Photo from my collection. This locomotive was withdrawn in July 1997 and scrapped. SP30-109 (Fablok 6520/1964), photographed in Kłodzko on May 1, 1991, probably with a track maintenance train. Photo by M.Plewka (from my collection). 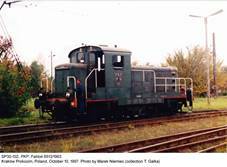 SM30-174 (Fablok 6954/1965), photographed near Maksymilianowo on October 6, 2003. Photo by Zenon Maternowski (from my collection). 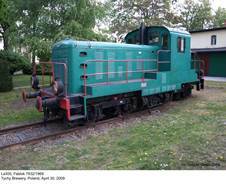 Once rebuilt into a SP30 and then converted back to the original version, this locomotive still remains in use. 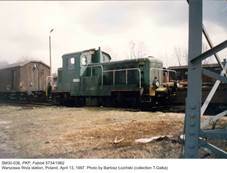 SP30-188, photographed at the Kamieniec Ząbkowicki depot on April 24, 1994. Photo by M.Zaworski (from my collection). SM30-1000, photographed in Sochaczew on June 25, 2000. Photo by Bartosz Łoziński (from my collection). Anolther picture taken by this author: SM30-036, Warszawa Wola station, April 13, 1997. 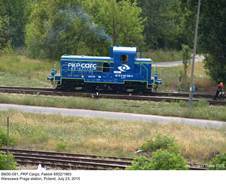 This locomotive still remains in use with PKP Cargo. 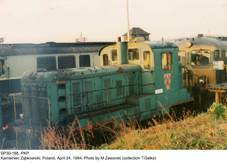 SM30-176, photographed in Lublin on November 22, 1997 (author unknown). This locomotive is also still in use. SM30-091 (Fablok 6502/1963), still in use with PKP Cargo. 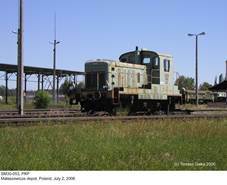 Warszawa Praga freight station, July 23, 2015. 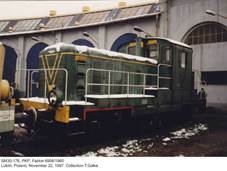 SP30-102 (Fablok 6513/1963), rebuilt in 1974, photographed at the Kraków Prokocim depot on October 10, 1997. Photo by Marek Niemiec (from my collection). This locomotive was withdrawn in 1998. SM30-531, photographed at the Industry and Railway Museum in Jaworzyna Śląska on May 25, 2016. SM30-07, PKP (Fablok 3536/1960), photographed probably in Poznań, date unknown. The banner reads: ‘On April 16 we vote on the FJN list’. In fact in those times it was not possible to vote for any list other than that of the FJN (National Unity Front). 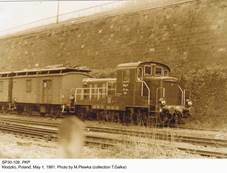 SM30-07 was later fitted with heating boiler and became SP30-07. Photo from my collection. SM30-211 (Fablok 6991/1965) in almost pristine condition despite its 52 years; Chabówka, Poland, May 6, 2017. 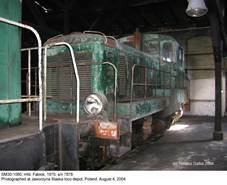 First post-war diesel locomotive, developed in Poland, was Ls40, built by Pierwsza Fabryka Lokomotyw w Polsce (First Locomotive Factory in Poland) of Chrzanów, commonly known as Fablok, in 1952. 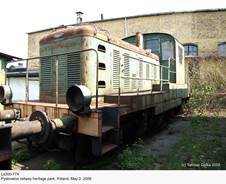 This machine, based on pre-war German Deutz OMZ 122, was a light switcher fitted with 40 hp diesel engine, mechanical transmission and mechanical brakes. 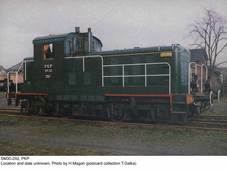 It was built mainly for various minor industrial establishments, which had their own sidings; only nine examples were used by PKP as class SM02, but they were suitable only for service duties. Certainly more powerful switcher was necessary, not only for PKP, but also for many industrial operators, for which tractive effort of just three tonnes, provided by the Ls40, was far too low. Mechanical transmission was considered suitable for light machines only, while hydraulic one was out of question, as torque converters were not manufactured in Poland. 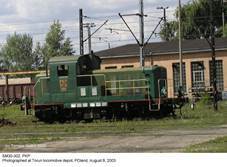 Thus, for the first time in Polish locomotive industry, electric transmission was chosen. Design of such locomotive, designated 1D, was prepared by the Central Design Bureau of the Railway Stock Industry (CBK PTK) between 1954 and 1955. Production was entrusted to Fablok and prototype, with factory designation Ls300, was rolled out in 1956. 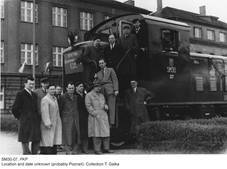 According to the article by Zbigniew Tucholski (see References), it was assigned serial number 4700/1956 – in fact the same serial was assigned to a 1U fireless locomotive! 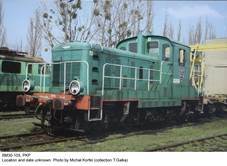 In PKP service, this machine was initially classed LWe55; on July 1, 1959, with new relevant national standard introduced, it was re-classed SM30. 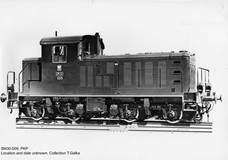 By necessity, SM30 – in fact first indigenous diesel locomotive suitable for line service, albeit only with light drafts – was a simple and straightforward design, deliberately making use of as many off-the-shelf components as possible. 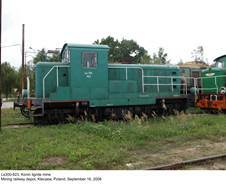 Thus, Wola V Roka-300 engine was a modification of the power unit used in military vehicles and light vessels, 600 V DC generator was developed from a stationary unit and LT-31 traction engines were of the type used in streetcars. Such policy could not contribute either to high performance or to economy, but these factors were then of minor importance. Production lasted until 1970 (some sources give 1969) and totaled 293 examples for PKP, all given consecutive service numbers. More SM30s were built for various industrial operators (a total of 616 is quoted in most references, which gives a grand total of 909 machines). PKP acquired several SM30s from industry (various sources give nine to thirteen), which has caused some confusion concerning total output. Industrial operators had no uniform designation system, so their engines were designated as either SM30 or Ls300 plus service number (from 501 onwards, to distinguish from PKP machines, sometimes corresponding to serial, but this was not the rule). Between 1959 and 1970 seven Ls300s were purchased by armed forces (military class WP-07); at least one of them still remains in use. 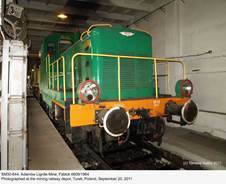 Some locomotives of this type (both from PKP and industry) went to various private operators, who had about 25 examples in mid-2014 (possibly not all operational). 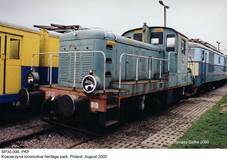 According to www.kolejowaklatka.org, at the same time PKP had 44 SM30s, the oldest of them being SM30-017 (Fablok 3662/1960). Most important modifications introduced during the production run concerned the power plant: V Roka-300 engine was in later examples replaced by its improved derivative 2DVSa-350, up-rated to 350 hp. 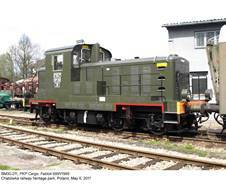 In the 1980s, during overhauls, many locomotives of this type were fitted with license-built Henschel 16H12A units. LT-31 traction engines were later supplanted by more modern LKAa-310 units. Other modifications concerned mainly minor items of equipment. First production SM30s could be externally distinguished by rectangular side handrails, which were later modified and given more complex shape. SM30 was primarily intended for switching, but it was also sometimes used with local passenger trains, often hauling one, two or three light two-axle passenger cars. Tendency to eliminate steam locomotives from such service resulted in an attempt to produce a passenger derivative of SM30, fitted with an electric car heating device. Low-voltage (500 V) system, fed from main generator, was chosen and first conversion of SM30-232 was completed in late 1970. Tests were considered satisfactory, but first ‘production’ machines – all converted from SM30s – appeared only in 1974. To distinguish them from standard version, they were re-classed SP30 (P for ‘passenger’), service numbers remaining unchanged. Actual number of converted machines is difficult to estimate. 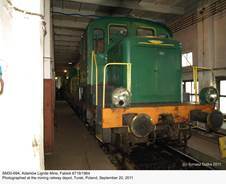 LSSP gives 106 (excluding the prototype conversion), delivered between 1974 and 1977, many other sources give 109, while detailed rosters available at www.kolej.pl/~jareks list 115 examples. In service it soon turned out that at low speed, typical for many local lines, generator yielded only 200 to 400 V and heating was very inefficient. 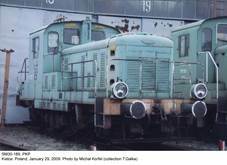 Comparatively few cars were also fitted with low-voltage heating systems, while special two-axle 94A cars were not successful, only 42 examples being supplied to PKP between 1976 and 1977. Thus obsolete steam heating systems (with heating cars) remained in use and most SP30s were in fact used as plain switchers. 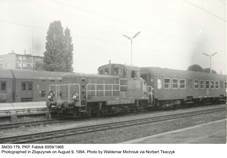 Last passenger cars with 500 V heating systems survived until late 1980s. On June 1, 2000, all forty-six SP30s remaining in service were re-classed SM30 (again retaining their service numbers) and heating devices were removed from those that still had them. One example of this class, SP30-006, is displayed at the former locomotive depot in Kościerzyna. 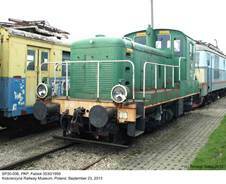 Another one, SP30-218, was transferred in December 2005 from Łódź Olechów depot to Skierniewice, to become a part of the PSMK railway fan society collection. There are even plans to restore it to the operational status. Both preserved SP30s had probably been withdrawn before June 2000 and thus were not re-classed. It was intended to supplant SM30 with more modern SM25 with hydraulic transmission, but only three examples were built in early 1960s. Ultimate replacement materialized in 1968 as 401Da – three-axle switcher fitted with 350 hp Henschel diesel, which was later produced in quantity and supplied to industrial operators only. In late 1990s PKP intended to keep about a hundred SM30 and SP30s in service for local trains (often comprising one or two passenger cars), as a more economical alternative to 800 hp SM42s, but these plans never materialized. According to SK, on January 1, 1999, PKP had 63 SM30s and 33 SP30s. AL lists 79 examples in the PKP inventory five years later, probably not all of them serviceable. Despite their obsolescence, many more SM30s are still used by industrial establishments. 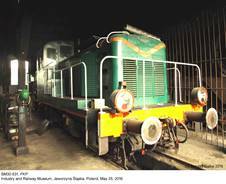 A few machines have already found their way to museums, railway stock heritage parks and collections maintained by railway fans. 1) LSSP gives 107, rosters quoted in SK give 109 examples, those available at www.kolej.pl/~jareks – 115. - www.kolejowaklatka.org (website by Marek Dąbrowski).